I wasn’t super excited about going to Boston in January. Experiencing Boston’s epic winter weather wasn’t high on my list of life achievements. Passing the frozen Charles River on the way to 25 First Street in Cambridge, I didn’t realize that what was to come would equip me to better help others. HubSpot’s Pipeline Generation Bootcamp was my destination. 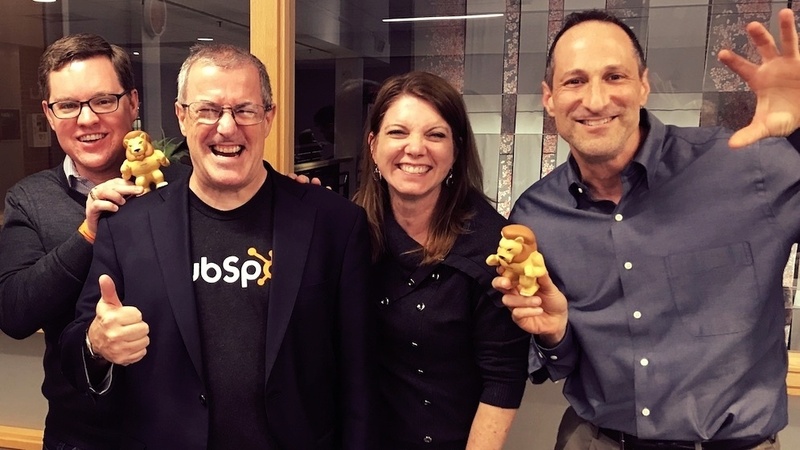 Two of HubSpot’s veteran salespeople, Dan Tyre and David Weinhaus welcomed us to their world headquarters for what was to be two days of intense, game-changing sales training to make us sales LIONS! Creating a formal sales process is something we’d never done at 30 Degrees North. We had a routine of meeting with a prospective client, gathering information about their requirements, and then generating a proposal. This was just our natural flow and made sense. I don’t have any formal sales training. Like a lot of things, we just figured it out as we went and made changes when things didn’t turn out the way we liked. But, as I learned in bootcamp, there’s a better way. Following a sales process for the entire sales cycle is critical. Before, our process really only started when someone asked for help. Now we have an entire process for reaching out to people we’ve identified that could use our help and how to uncover the best ways we can help them achieve their goals. Research companies that need help growing. Find a few key areas where we can help. Reach out to them via phone and email with a personalized, helpful message. Connect Call - spend about 15 minutes helping them and learning about their business challenges. Exploratory Call - spend about 45 minutes learning more about their business and challenges and determine if there are ways that we can help them. Goal Setting Call - spend about 45 minutes understanding their goals and determine if there is a way that we can help them achieve their goals. We’ve started using this process and are really enjoying the results. Knowing exactly what to do next gives me confidence in a skill that hasn’t come naturally. When you are trying to find your next client, the natural tendency is to sell, sell, sell. But, what I learned in HubSpot’s bootcamp is that selling today needs to be more about the prospect than you – and you should really help, help, help. The answer has made this unnatural salesperson a lot more comfortable reaching out to someone I’ve never spoken to. Not many people like a sales pitch. Just about everyone likes help. Most of the companies I find need some sort of help with their marketing. They might not know it yet, but they do. When I call and only offer to help, maybe by giving them a tip to improve their website conversion rate, why should I be scared to talk to them? If someone is going to hang up on me when I’m only trying to help, we probably don’t have a future working together anyway. If I can leave a company with one thing they can do to improve their business, then I’ve done my job. Hopefully, if the time is right, that will open up a larger conversation. If not, I’m hopeful they will remember the “salesperson” that called and didn’t ask anything in return. Helping first is a differentiator that will set you apart from all the other salespeople that are only trying to sell. People want to buy from people. Shocking! Selling has turned into such a game of phone calls and emails that you never want to receive. Relating to someone else on a human level is a gamechanger. It’s no longer B2C or B2B but H2H: Human to human. This simple revelation is key to transition from a selling mindset to a helping mindset. Dan emphasized over and over that we won’t make any more cold calls; only warm calls. When you take the time to research a prospect and learn a little more about them instead of just going off of a script, you make a connection. You show an interest in that person that the other 99 aren’t. You are doing the same thing you would do if you met someone at a party. The conversation changes and you are just two people talking, not a salesperson and a prospect. A key benefit to this type of approach is that your personality can come through. You aren’t just a faceless machine trying to make a quota. People want to buy from people and you have to be a person to make this work. How do you be a human in an email? Your prospects see and hear you. They can see your smile and personality come through, all making you more human. Who else is sending video emails??? It might not be long before many more are, but for now it’s certainly unique. It shows that you took the time to reach out with a personal message. Wistia’s Soapbox makes it very easy to create video emails and I’m definitely adding this into my plan to help more people. The 30 Degrees North team was built to work together as people, not just a business trying to make a profit. We want that to extend to our clients as well. For us to achieve success, we have to work well together. Not just as business people, but as just… people. For me, this philosophy now further extends to before we even start working together. Attending HubSpot’s Pipeline Generation Bootcamp changed my approach to finding our next clients. There are a lot of companies that need help and we want to help them. Not everyone will be the right fit for us to work together long term, but our prospects are getting more value out of our conversations and we are building more meaningful relationships. And that should put a smile on everyone’s face.